I think Caitlin R. Kiernan is one of the most overlooked, underrated writers of our time. She's won World Fantasy Awards and her work regularly appears in year-end "Best Of" editions, but she's never had the commercial breakthrough that many lesser writers have garnered. It would be a great thing if Agents of Dreamland changed that. Let's see, where shall I start with this novella? Its layered, dense, fantastic writing? Its non-linear time structure (albeit clearly indicated by the chapter headings)? Its creepy, paranoid atmosphere, an artful, unexpected blend of the Lovecraft oeuvre and The X-Files? Its horrific story of a fungal alien invasion fit to give anyone nightmares? Its complex characterizations, as effortlessly written as I've ever seen? I've read quite a few novellas so far this year. This one is a standout. Please, buy this and give Caitlin R. Kiernan the fame she deserves. 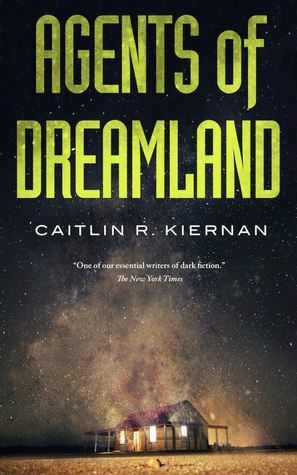 Sign into Goodreads to see if any of your friends have read Agents of Dreamland. It's an excellent intro to her work, I think.